All drawings held on RandomWinners.com use true random numbers, generated by a special device that operates based on quantum optics. Drawing a winner that is truly random requires a solid guarantee that the process of generating random numbers cannot be predicted or influenced in any way. Computers are deterministic systems. Given a certain input, a program will always produce the same output. Because of this very fundamental property, it is impossible for a program to produce a sequence of random numbers. The sequence may have some of the properties of a random sequence, and thus pass some statistical randomness tests, but it is always possible to reproduce it. As the sequences they produce look like random sequences, these generators are called pseudorandom number generators. Excel, PHP, Java and any other software or programming language fall into this category. The only way to generate true, impossible to predict random number sequences is by using a physical random number generator, that can either be based on processes described by classical physics or by those described by quantum physics. The evolution of a system described by classical physics can be predicted, assuming that the initial conditions are known, although in practice it is virtually impossible to gather the required initial data. In contrast, quantum physics is fundamentally random. Quantis, the device used by RandomWinners.com, is based on quantum physics. From a quantum physics point of view, light consists of elementary "particles" called photons. Photons exhibit in certain situations a random behavior. One such situation, which is very well suited to the generation of binary random numbers, is the transmission upon a semi-transparent mirror. The fact that a photon incident on such a component be reflected or transmitted is intrinsically random and cannot be influenced by any external parameters. 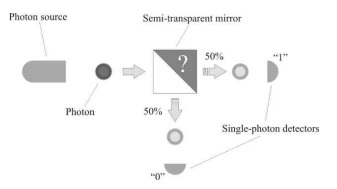 Two single-photon detectors are placed at either side of the mirror. If a photon hits the first detector, the recorded value is "1"; if a photon hits the second detector, the recorded value is "0". This process outputs a random sequence of bits that RandomWinners.com uses to draw winners in a completely unpredictable, impossible to influence manner. Click here to read the complete whitepaper on randomness, random number generators and the Quantis quantum device. QUANTIS has been evaluated and certified by the Swiss Federal Office of Metrology (also known as METAS), the Swiss national organization in charge of measurement science, testing and compliance. It confirmed that the quality of its random output complies with the highest requirements. QUANTIS has also been evaluated by Compliance Testing Laboratory (Bangor, UK), which confirmed that it is "suitably unpredictable and fit for purpose". QUANTIS has also been approved by national authorities and can be used for gaming applications.